I’m pretty new to this whole bubble tea lark, but for those who don’t have a clue what I’m on about…it was, like many other wonderful things….made in Taiwan at some point in the 1980’s (a bit like me..except for the Taiwan part). In layman’s terms, it is a tea based drink; mixed with either fruit, fruit syrup or milk; can be served hot or cold; in numerous flavour’s. 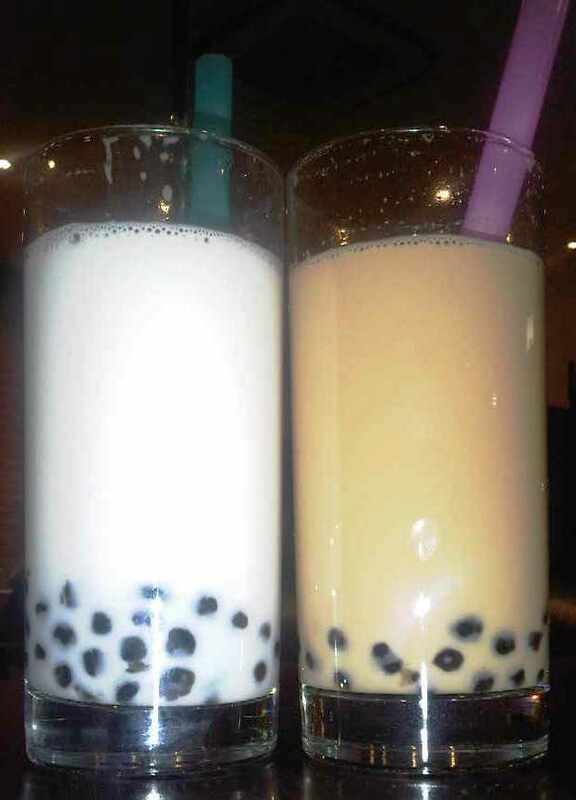 BUT the key to bubble tea, setting it aside from other tea’s is the chewy ‘bubble’s’ or ‘pearls’ made from a starch like tapioca. In one word, it truly is yummy! It was love at first taste! My first run in with Bubble Tea was on a recent Thursday evening, almost two weeks ago, yes…I remember it fondly. I had finished dinner and was looking for a way to pass time whilst waiting for my sister to show up. So off I went with my dinner companion to Golders Green, where we walked into a little coffee shop – Old Tree Bakery. I’ve been past this little gem numerous times and was happy to finally try it in the flesh. So we walked in, sat down and were given the drinks menu to look at. After asking the waitress for her suggestion, I ordered the original hot milk bubble tea for myself and promptly chose the coconut version for my obliging friend (more because I wanted to try it!!). So above you can see our Bubble tea. On the left is the coconut flavoured tea and on the right is the original. On what was a rather chilly evening, the warmth of the tea coupled with the chewyness of the bubbles consumed through a larger than normal straw made the most comforting drink – hence my newly found addiction! Also, call me sad, but I loved the excitement of getting a stream of bubbles mixed with milk with every sip! With regard to the flavour choices, I must say heated coconut makes for a very sweet drink and as comforting as it is, both myself and my companion preferred the original tea. So much so that after consuming exactly half of my tea, I took pitty on my friend, sipping slowly at the coconut flavoured tea I so selfishly picked, that I gave up my first choice and switched to the coconut! After this first run in, I knew that I had an addiction on my hands as I was definitely hooked…so off I went to search for additional Bubble Tea dealers to satisfy my need! You may take me in July, please check your diary! Oh, I was there, sitting beside you and your friend that night! How random! Its a small world..! Thanks for the comment…Im a big fan! I just want to let you know that 11th & 12th June is the Anniversary of Old Tree Bakery. To celebrate this exciting event, all juice type drinks and Taiwanese Bubble Pearl type drinks will be half price! Further more, we will offer one traditional Taiwanese snack for free!